I don't know about you, but I'm already sick of reading "Best of 2009" lists. That said, a select few have been able to pique my interest. Two in particular deal with the year's most ignored titles. Gamasutra.com's list looks at the most overlooked games in general, while GamesRadar.com's list looks at the best Wii games (that died at retail). 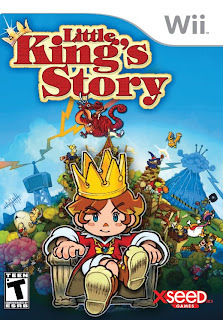 One title ties the two lists together: Little King's Story. I can't say I'm surprised Marvelous Entertainment's cute-and-cuddly RTS failed to light up sales charts in the States, but it still makes me sad. I'd love to play it, but there are 20 games I'd buy before it. That is, unless I could find it for a really good deal.